At 7.50 this morning after I’d dropped the children at school, I noticed the familiar haze that comes with searing heat, concrete, and asphalt. My children were making their way into class for the beginning of the day and it was already 41 degrees. That’s 105 for my American friends. A few hours later I hopped back into my mobile furnace car, the temperature guage let me know we’d moved on towards a delightfully cleansing 47 degrees. It was 11 am. I won’t even make the American conversion. After two and a half months of tights, boots, long sleeves and winter walks along the beach there was no mistaking it. We were a long way from home. Or should I say, our other home. It has become plainly obvious on our return that we now have two. My mother’s final voicemail message before I boarded the flight said it all. “Safe travels home blossom, well, to your other home”. This is why the “where do you live” or “where are you guys from” always involves a complete sentence for an answer. “We’re Australian but we live in….” came out of my mouth so many times over the past few months. “Would you like to sign up for our loyalty program?” a shop assistant would ask. I’d hesitate, looking for a nicer way to say no. The fourth little traveller, a boy who has somehow developed some sort of confused Boston accent (we’ve never lived in Boston) who refers to us as his porents and asks if I’m having a gin and tawnic, reassured me. “It doesn’t matter where they think you’re from, you know where you’re from.” Out of the mouths of expat babes. As I watched the little travellers reunite with friends in Doha it was as if their Australian life was gently tucked away safely in the back of the cupboard next to the good silverware. It would come again at Christmas. They raced towards old friends in the playground immediately coming nose to nose to see who had grown the most over the break. I listened as they shared holiday stories, discussed new school shoes, necklaces from Grandma and new haircuts. “When did you get home?” a teacher asked. 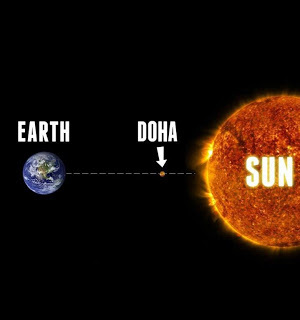 “Yesterday – we left our home at the beach at night time and we were back at our home in Doha by breakfast” giggled the second traveller. We have two homes, there’s no doubt about it.